OCBC just got word from OC Parks that this weekend and into next week -rain permitting- the San Diego Creek Multi-Use path will be closed for repairs of flood damage under Jamboree Road. This heavily traveled segment of the Regional Parks Connector Bikeway from Newport to Irvine Regional Park is the down stream end of Peters Canyon Wash where it runs into the bay. It connects to the Bayview Trail along Jamboree. The detour OCBC recommend for side walk / bike path preferring cyclists being forced off the Class I bikeway around the closure is the side walks on University between Jamboree and the Bonita Creek path. BCI Road using and Edge riders will find cross walks to the Class II Bike Lanes on University. The Bayview side path (along the west side of Jamboree) should be open, pending occasional activity moving in supplies and equipment. Road Closed signs will be in place, it is unknown if a detour will be posted for this short closure. Beginning October 1, 2018, all cyclists who wish to access the cycling route at Camp Pendleton are required to register with the new Department of Defense Biometric Identification System before they enter the base. To register for a DBIDS bicycle pass, individuals need to go to the Main/Vandegrift Boulevard visitors center (Oceanside gate) and are required to show an acceptable identity source document such as a valid government issued photo ID (I.E. Real ID ACT compliant driver's license, state identification card, or passport) to establish their identity and submit to a criminal background check as well as having their photograph and fingerprint taken. The visitor's center hours are Monday to Friday, from 7:30 a.m. to 3:30 p.m.
MCB Camp Pendleton will continue to foster positive relationships with our neighbors by allowing access to cyclists and we appreciate that most cyclists have been good visitors during their time on the base. We encourage cyclists who wish to enjoy uninterrupted access to the base to come in as soon as possible to obtain their DBIDS ID. We anticipate that the volume of passes issued in late September and early October will require long waits, so don't procrastinate. 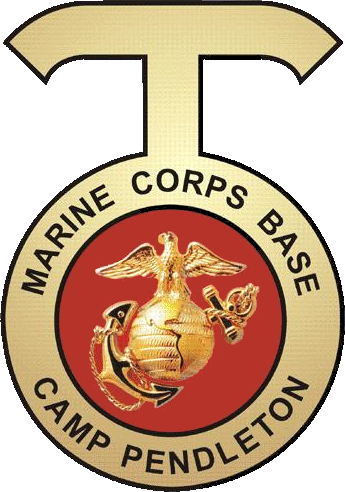 The USMC have advised the cycling community that failure to obey their single file riding rule and leaving the designated route from Las Pulgas gate to the Main Gate may jeopardize continued access to non-military cyclists. Remember also to renew your on line registration to ride through the base; the USMC has s system in place to register you in advance for one year. If not registered you may be turned away at the gate to experience the freeway shoulder. Update: There is now a posted detour to the Class I bikeway (San Diego Creek / Peters Canyon / Regional Parks Connector / Mountains to the Sea ‘Trail’) to avoid riding on University while the Class II bike lanes are gone. As part of the I-405 Improvement Project, the McFadden Ave. bridge will be closed for full demolition as early as August 7, 2018 at 10 p.m. The bridge will be closed for approximately 12 months for reconstruction. Vehicles, bicycles and pedestrians will not be able to use the bridge during reconstruction. * EB McFadden Ave. to NB Goldenwest St. to NB Bolsa Ave. to SB Beach Blvd. * EB McFadden Ave. to SB Goldenwest St. to EB Edinger Ave. to NB Beach Blvd. * WB McFadden Ave. to NB Beach Blvd. to WB Bolsa Ave. to SB Goldenwest St.
* WB McFadden Ave. to SB Beach Blvd. to WB Edinger Ave. to NB Goldenwest St.
OCTA is starting a 405 freeway widening project that will run from Costa Mesa to the 605 in Seal Beach. Some of the bridges we use to cross the 405 (e.g. Ward, Talbert) are set to be rebuilt and may be closed entirely during construction. Please email roads@bikeirvine.org if you notice any closures. Your humble ride coordinator lives in South OC, so I may not be aware of when these closures start and their impact on our routes. The county has posted signs advising that the trail will be closed from Taft to Memory Lane, beginning January 22 through April 30, 2018. Unfortunately the powers-that-be who are developing former MCAS El Toro into teh Great Park have closed the old Perimeter Road to bicycles. This road runs along the south and east sides of the base. This eliminates the connection from Marine Way to Astor and Fairbanks in the East Irvine Industrial Complex which we enjoyed during the summer & fall of 2017. Riders can still enter the area on Marine Way off Sand Canyon, but will have to turn left up either Ridge Valley or Sky Hawk/Bosque to Irvine Blvd. Bummer, especially for those of us who live in Lake Forest! Back Bay Drive will be closed between Shellmaker and San Joaquin Hills roads from 7 a.m. to 4 p.m. Monday through Friday until approximately July 21 due to crews trimming overgrown vegetation to make the roadway safer, officials said. Due to our winter rains and a construction project, homeless persons camping in the riverbed and along the east side of the river in the Orange/Anaheim area have moved alongside (and in come cases into) the bike trail. The area most impacted is between the 5 freeway and Katella, along Anaheim Stadium. In online forums cyclists are reporting confrontations with the homeless in this area. You may want to consider alternate routes. Photos by M.B., taken 2/25/17. Used with permission. Red Hill Ave bridge over 405 is open again. On behalf of the Newport Bay Conservancy, I would like to let you know that Coastal Cleanup Day is Saturday, September 17th, from 9 AM-NOON. Because of this, the path on Back Bay Drive from San Joaquin Hills Road to Eastbluff Drive will be closed during that time. The County of Orange will be working on the Aliso Creek Trail, repairing and slurry sealing the pavement, from September 2016 through November 2016. The work will take place on weekdays and the trail should be open and available to riders on weekends. As of August 16, Irvine Blvd. is fully open between Modjeska and Allred, with new pavement, striping and bike lanes (and unfortunately a couple more traffic signals). Enjoy! The good news is the trail between Lakeview and Tustin is now open, it is no longer necessary to detour on Riverdale. The San Diego Creek Trail extends from the Upper Newport Bay upstream to the Irvine Meadows Amphitheater. Up stream from going under the 133 Laguna Freeway, the route crosses the creek on a side path of the Spectrum road bridge, then continues along the creek under the 405 Freeway. This bridge has been closed to traffic and cyclist usually crossed in the road, but now is full of parked and moving construction vehicles so share the road. The side path - the wide side walk intended for trail users - has a temporary water pipe right across the path from the fire hydrant. This is a temporary supply but services the water fro the new construction yard at the end of Spectrum road... but may be a trip hazard for a long time. Also there are no painted crosswalks so watch out for traffic now when continuing on the trail across Spectrum, or crossing the road to use the connector to Pacifica. Irvine Blvd is being widened and curbed between Modjeska and Alton. Traffic is narrowed from 6 lanes to 2. The City of Irvine has done a great job of providing a generous bike lane, as well as slowing traffic speeds through the segments and the pavement is being kept in good shape.